In this webinar, Dr. Kenneth Mubea (the Capacity Development Lead) at the Regional Centre for Mapping of Resources for Development (RCMRD) shared some of the RCMRD's experiences and projects harnessing open data to achieve sustanaible development in Agriculture. 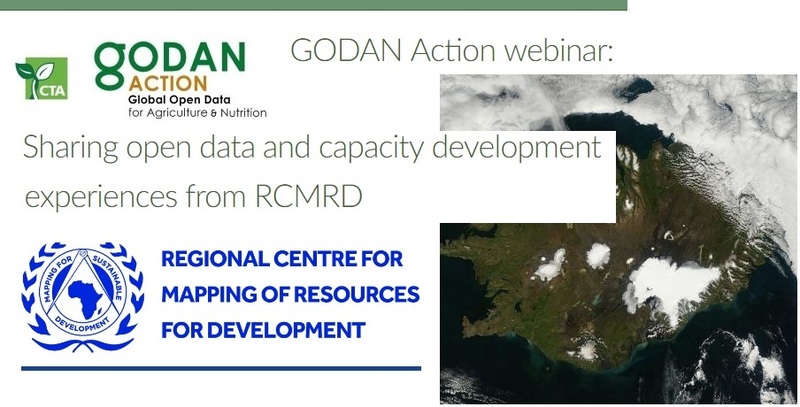 GODAN webinar series are facilitated and hosted by CTA. Modern day farming relies on weather information in order to plan ahead of extreme weather conditions such as drought and floods. Earth observation data plays a critical role in building resilience to climate change as well as reporting on sustainable development goals (SDG’s). There are new opportunities to use open data in earth observation such as Landsat and the sentinel data. In addition, there is need to invest in hydromet services to build resilience to climate change and help citizens with accurate weather forecasts. *RCMRD (@RCMRD_) is an inter-governmental organization established in 1975 (Nairobi, Kenya) and currently has 20 Contracting Member States in the Eastern and Southern Africa Regions. RCMRD’s mission is to promote sustainable development using earth observation and thus SDG’s.